Once you have signed up, activate the Spinner Chief add-on, and navigate to RSS Aggregator > Settings > Spinner Chief in your WordPress dashboard. You should see the following settings that allow you to set up your account information in the add-on’s settings. 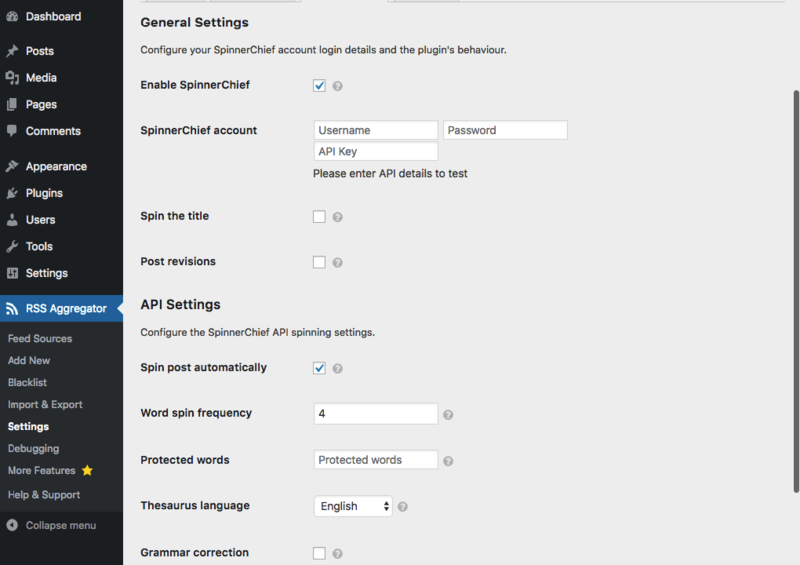 Enter your Spinner Chief account username, password and API key in the form, and click the Save Settings button. The message beneath the details should now say Authenticated if the username, password and API key were successfully authenticated by Spinner Chief. You’re also shown the number of queries you have remaining for that day, depending on the type of account you have. To enable the spinner and start spinning the content of your imported posts, simply tick the Enable SpinnerChief checkbox in the add-on’s settings. SpinnerChief also has the ability to also spin the title of your imported posts. The SpinnerChief add-on uses SpinnerChief’s API to spin your content. The options shown on the add-on’s settings page reflect the settings given to the API. These settings are documented by SpinnerChief, on their API page (You must be logged in to view the page). To learn more about these settings and how they affect your spun content, we recommend that you log in and try using the spinner on their site. SpinnerChief also offers a Post revisions feature. This feature puts the original content of the post as a post revision, so you can later compare the original content with the spun content.